Disappearing architecture as a record of the changing spatial present. Architecture as an expression of social condition, as if history were stored in walls and slowly subtracted through looking at it. Architecture as an outer frame and a scene for an inner encoding. My works result from sensing architecture - becoming a part of it at the point where the aesthetic and social space meet. The Horseshoe Development in Berlin-Britz, built between 1925 and 1933, marks the introduction of large residential developments, as well as the establishment of industrial working methods in the building industry of the Weimar Republic. Bruno Taut built the Horseshoe Development - a curved slab set at the centre of the estate - in the style of "new objectivity". It was inspired by the Bauhaus as well as the development 'Red Front' at the Fritz-Reuter-Allee, named after its colour. By contrast the architects Engelmann and Fangmeyer are named as standing for traditional form using romantic and playful elements. Through close city planning, the opposing ideas within the Weimar Republic became obvious. The project 'Agglomeration' examines how an architectural idea is born through the entanglement of utopian substance with inherent necessity, questioning the relationship between the model and reality. For a period of time in summer 2005 'agglomeration' is going to be a part of the Horseshoe Development. It merges with the architectural situation and checks which parts of the realised utopian ideas have spread. For Taut, architecture was not about style but function. I am interested in the specific peculiarity of the site and the situation, and in this way I develop my work according to the premises of the space, i.e. its topography. Therefore no space is neutral, no situation identical. The parallels between the part-privatisation of the Horseshoe Development and the Weissenhof Development in Stuttgart are apparent. This is a further development of my research 'Architecture and Economy' which I have started in the Weissenhof Development Stuttgart, the "case-study houses" Los Angeles, and the Berlin buildings by Erich Mendelsohn. At this point I would like to mention the idea of good luck - the horseshoe is a utopian form of building par excellence. What actually remains from this utopian reserve - what is still perceptible? In the horseshoe flank towards the Fritz-Reuter-Allee there are a few shops and a restaurant - on its symmetrically opposing side, the space is vacant and will function as a platform for research. The reconstruction of a show flat and a show shop will mark the entanglement of the public with the private. Responses from residents will be connected to a survey among chimney sweeps about good luck and living. The 'Agglomération' project examines how the combination of utopian ideals and practical constraints interacts with an architectural concept, and also investigates the relationship between models and reality. 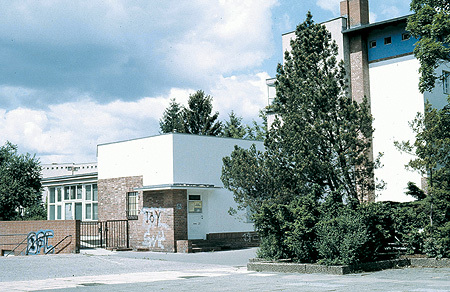 The Hufeisensiedlung ('Horseshoe housing estate'), built by Bruno Taut in the style of the New Objectivity movement, is the focus of this project by the artist Veronika Kellndorf. She deals with the effect that everyday realities have had on this architectonic utopia and poses the question: 'the horseshoe as a utopian form - is there anything tangible left of this ideal today?" "... The planning of this housing estate was shaped both by social needs and also by the characteristics of the site itself, which features two hollows with ponds: one pond which naturally has an orderly oval shape, leading to a regular arc-shaped structure being built around it - in the shape of a horseshoe - and the other pond which had no well-defined shape, around which was built a terraced public park which only served to emphasise the irregularity of the second pond's shape..."
In the course of her study of the privatisation of the Hufeisensiedlung and also of the change in the meaning of this public space that will be caused by this privatisation, Veronika Kellndorfer has also consulted the residents themselves. In early 2006, she collected photographs and postcards from private collections, and these now form a part of the estate's spatial reality. 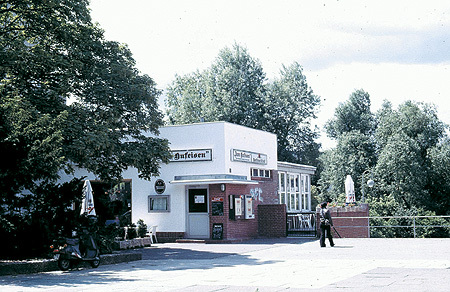 The buildings facing onto Fritz-Reuter-Allee are home to a series of shops and businesses which have a provincial, small-town feel: a baker's shop, a butcher's and a flower shop, a chiropodist's and a Croatian restaurant called 'Zum Hufeisen' ('The Horseshoe'). The premises opposite this restaurant is currently not occupied and, as part of this project, slides will be projected from the interior of this premises. The steps between the restaurant and the empty premises (which has been empty since the project began in early 2004) have been cleared and serve as a platform from which one has an overview of form of the site; at the same time, one can also see the slides which are projected onto the windows of the empty premises, and thus one is confronted simultaneously with the present and the past, and with the interplay of the public and the private. This empty front building has a neon sign which identifies it as a former public library.